Following the publication of the groundbreaking anthology of original Asian American graphic fiction, the Secret Identities team is back with a new collection—bigger, bolder, and more breathtaking in scope. Shattered expands beyond the superhero comic to edgier genres: from hard-boiled pulp to horror, martial arts, adventure, fantasy, and science fiction. 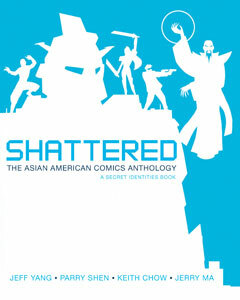 In these pages, an award-winning roster of writers and artists—including leading Asian American comics creators Bernard Chang (Demon Knights), Fred Chao (Johnny Hiro), Sean Chen (Iron Man), Greg Pak (The Incredible Hulk), Larry Hama (G.I. Joe), Takeshi Miyazawa (Runaways), and GB Tran (Vietnamerica); filmmakers Michael Kang (The Motel) and Tanuj Chopra (Punching at the Sun); literary standouts Jamie Ford (Hotel on the Corner of Bitter and Sweet), Gary Jackson (Missing You, Metropolis), and Bao Phi (Sông I Sing), and more—contribute new, original graphic stories that subvert, upend, satirize, and shatter the hidebound stereotypes that have obscured the Asian image since the earliest days of immigration: the stoic brute, the prodigious brain, the exotic temptress, the inscrutable alien, and the devious manipulator. Shattered incorporates thrills, chills, and delight while exposing the hidden issues, secret history, and vital truths of the nation’s fastest-growing and most dynamic community.